HARARE, Zimbabwe (CNN) -- Three men charged with plotting to overthrow Zimbabwean President Robert Mugabe were free on bail Wednesday. 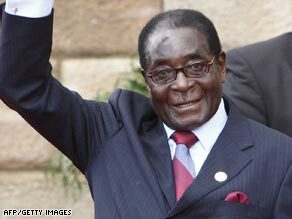 The trio are accused of plotting to overthrow Zimbabwean President Robert Mugabe. Freelance journalist Andreson Manyere and Movement for Democratic Change party officials Ghandi Mudzingwa and Kisimusi Dhlamini have been in jail for more than five months on charges of sabotage, terrorism and banditry. Each was released on U.S. $1,000 bail. The Movement for Democratic Change is Prime Minister Morgan Tsvangirai's party. "What we have are dangerous unsubstantiated allegations and the weakness of the state's case makes them right candidates for bail," said November Mtshiya, the high court judge. "The respondent [government] relied only on evidence provided by state security personnel and video footage of confessions extracted from the three men, which is itself being challenged," Mtshiya added. The trio, who denied the charges, were released for four days and re-arrested last week. Mtshiya said they were proper candidates for bail because they did not escape at the time. "They had ample time to plan their escape but they did not," the judge said. Their release comes a day after two journalists charged with publishing articles that could hurt the credibility of law-enforcement agencies were freed. The article named police and security agents allegedly involved in the abduction of rights activists from Movement for Democratic Change party last year, according to the paper's lawyer. Mugabe's government has detained a number of foreign and local journalists, and closed many privately-owned newspapers and radio stations. Western governments and donors have said they will not pour money into Zimbabwe's battered economic recovery unless political reforms, such as a free press, are implemented.